It is a disturbance produced in a medium which passes through the medium without changing its shape and size. In transverse waves, particle vibrates perpendicular to the direction of the wave. Transverse waves travel in form of crest and trough. Transverse waves can propagate only in solid mediums and only on the surface of liquid. They can not travel inside a liquid on inside a gaseous medium. In Longitudinal Waves, particles vibrate along the direction of propagation of the wave. Longitudinal Waves travel in the form of compression and rarefaction. The density and pressure of the medium are maximum at the compression as the particles come closer to each other and minimum at the rarefaction as the particles move away from each other. Longitudinal Waves can be produced in all the 3 mediums. Amplitude is the maximum displacement of the vibrating particle from the mean position. It is denoted by 'a'. The time period is the time taken to complete one vibration/ oscillation or time taken to complete 2 consecutive compressions or 2 consecutive rarefactions. It is denoted by 't' and its SI unit is second. 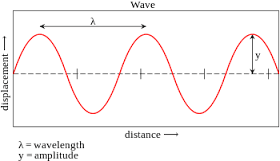 Wavelength is the distance between 2 consecutive compressions and rarefaction. It is denoted by λ (lambda) and its SI unit is metres.